The name “Skeleton Coast” conjures up romantic images of desolate beauty, and proudly remote Hoanib in the Kaokoveld does not disappoint. The dry bed of the Hoanib River supports a thin green ribbon of vegetation and the wild beaches of the Atlantic coast are within reach, with their noisy seal colonies and eerily quiet shipwreck remnants. 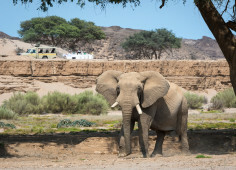 Eight large en-suite tents (including one family unit) and the main area provide shady viewpoints, while nature drives into the surrounding area reveal a wealth of desert-adapted wildlife. Desert-adapted lion and brown hyaena may also be glimpsed in this vast but far from lifeless landscape. INSIDER'S TIP: Take a drive down to the Skeleton Coast and a scenic flight back to camp to see such a diverse area both on the ground and in the air. Place: In a remote area of the Kaokoveld, with gravel-strewn plains and dry riverbeds that draw fascinating wildlife, lies Hoanib Skeleton Coast Camp. Explorations of this isolated yet diverse area take place via game drives along the riverbed’s narrow ribbon of vegetation, where a surprising wealth of desert-adapted animals can be found, while the research centre provides further insights. The desolate Skeleton Coast with its shipwrecks and noisy colonies of Cape fur seals is accessed either by a fascinating drive or scenic flight, depending on the weather. Accommodation: The eight large en-suite tents (including one family unit) and the main area and pool look out over rugged scenery: a wide valley that slopes down to the almost-always dry Hoanib River. Purpose: This camp is fully solar powered, is a joint venture with the neighbouring Conservancies of Anabeb, Torra and Sesfontein, and hosts researchers committed to conserving desert-adapted lion, brown hyaena and more. Situated within the stark and remote Skeleton National Park, Hoanib Skeleton Coast Camp is an excellent tented camp in this rugged place of huge beaches and dramatic weather in Namibia. Named after the whale bones and ship wrecks washed up along this shore, the Skeleton Coast is well-known for its bleakness yet brash beauty. Accommodation in simple tents at Skeleton Coast Camp offers luxurious facilities including comfy beds, en-suite bathrooms with hot showers, complimentary toiletries and insect repellents. Hosted by the Schoeman family, the Skeleton Coast Camp has been running trips in the region for longer than 20 years. Up to eight passengers get treated to camping in dome tents in tiny campsites, travelling in light aircraft and hopping between beaches and private airstrips. They stay in the Kuidas Camp on the dry Huab River, Leylandsdrift Camp on the Hoarusib River and Kunene River Camp on the banks of the Kunene River. This part of Damaraland in Namibia is full of opportunities to bird watch, game view, take nature walks, see the seal colony and Himba villages and just drive to the coast to walk. See wildlife such as gemsbok, springbok, giraffe, ostrich, brown hyena, Hartmann's Mountain Zebra and occasionally lion and cheetah, desert adapted elephant and even black rhino – there are more than 200 species of birds to be seen! Those seeking adventure further afield can take a day trip to explore the stunning Skeleton Coast area and its many attractions including the vibrant coastal town of Swakopmund, Sarrusas Spring, Cape Cross and more. 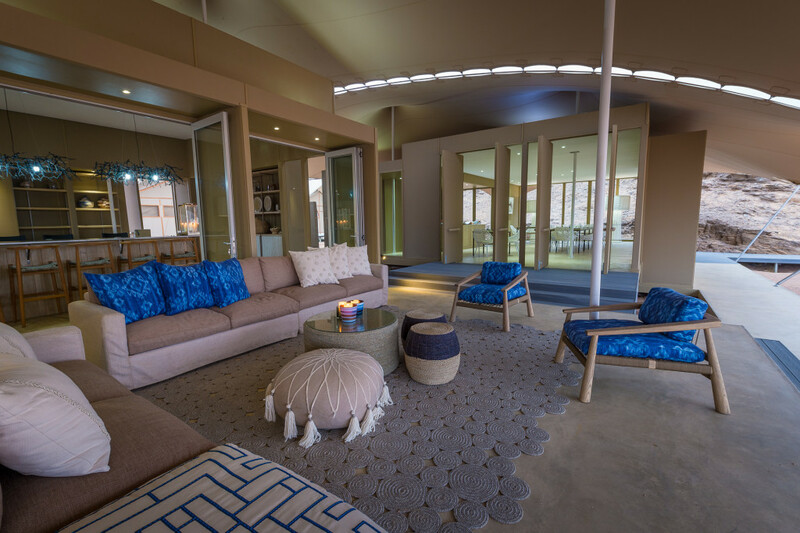 Skeleton Coast Camp offers time to relax in the lounge, bar, indoor and outdoor seating areas and the library. Guests love the wholesome food and array of beers and other drinks at the bar. Adventure, Birding, Wildlife, And more.